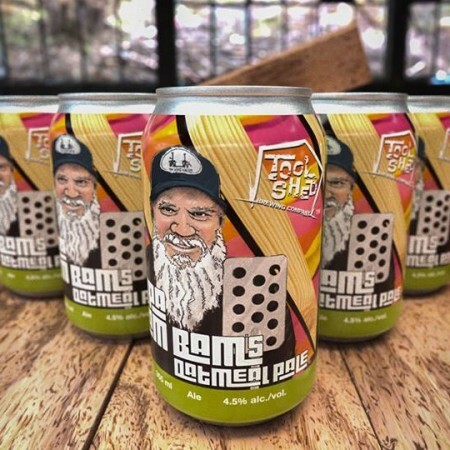 CALGARY, AB – Tool Shed Brewing has announced details of a new beer that pays tribute to a pioneer of Calgary’s homebrewing scene. A session-able Oatmeal Pale Ale utilizing Cascade as a single hop variety which imparts sweet floral citrus aromas of grapefruit and limes balanced with slight spicy pine notes on the palate. At 4.5% with a balanced crisp bitterness, This beer is a perfect companion for summer patio sessions, but then again so is Neil! Papa Bam Bam’s Oatmeal Pale Ale will be officially launched this Thursday June 1st at the craft beer bar and restaurant National at Westhills (180 Stewart Green SW, Calgary). For more details, see the Facebook event listing.